The phrase is common in the United Kingdom, but less commonly used in North America. Joe started using this phrase as an analogy (without giving it much thought) when he was presenting results from the Bridge Creek Intensively Monitored Watershed project using beaver and beaver dam analogues around 2010 or 2011. Joe kept using it for about a year before Nick finally called him out on it, and asked what does that mean. Joe pointed out that it simply means something works, but doesn't cost a lot. When Nick mentioned that he and many other (Americans) had never heard the phrase, they finally realized that Joe must have picked it up (stolen the idea and phrase) when he was studying and working in the UK. This gave further rise to Joe's English colleague's claim that we really are sometimes separated by a common language. We use the phrase 'cheap' endearingly and partially literally. Cheap literally means 'low in price; worth more than its cost.' Sometimes, projects and 'cheap and cheerful' solutions really can be substantially lower in price as compared to other alternatives. However, in any design or planning project, someone's time and expertise is what you really are paying for. Sometimes, that cost is hidden (e.g. someone volunteers time or has salary paid for elsewhere), but when its not that is where absolute costs may not appear so 'cheap'. This is why it is particularly important to emphasize efficiency and the 'worth more than its cost' part of the definition. In other words, you may still have to pay someone the same amount to design a restoration project, just pay them for design footprints that you measure in 10's of miles as opposed to 100's of feet (i.e. cheaper unit costs). 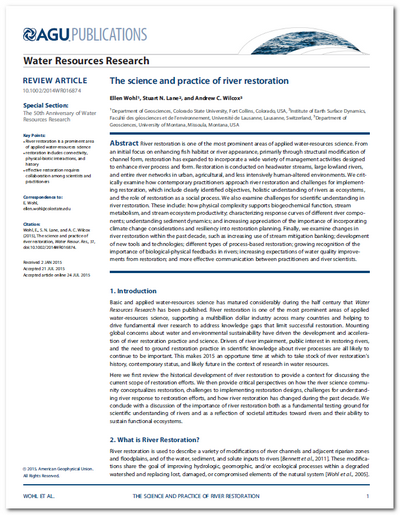 "Researchers have also sought to provide tools accessible to practitioners for addressing challenging issues such as addressing uncertainty [Wheaton et al., 2008; Wilcock, 2012], estimating sediment fluxes [Pitlick et al., 2009], and identifying river segments amenable to specific types of restoration, such as what Wheaton refers to as the ‘‘cheap and cheerful’’ approach [Wheaton, 2013] of reintroducing beaver (Castor spp.) to historically occupied river habitat in North America [Macfarlane et al., 2014] and Europe [John and Klein, 2004]." While we have mentioned the 'cheap and cheerful' phrase perhaps too many times in workshops, webinars and talks, we had not yet published a paper elaborating the concept. While we appreciate Wohl et al. (2015) mentioning this concept in their topical review of contemporary restoration practice, we can't take credit for the idea of 'cheap and cheerful' restoration. However, we will continue to take part in expanding the uptake of the mindset, and trying to innovate and make examples of 'cheap and cheerful' solutions more practical to implement. Wohl E, Lane SN and Wilcox AC. 2015. 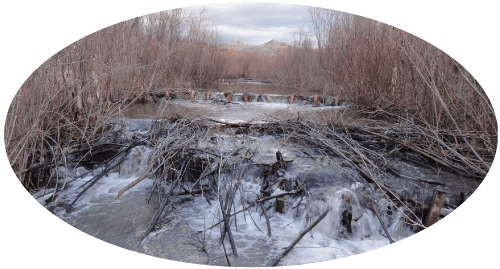 The science and practice of river restoration. Water Resources Research. DOI: 10.1002/2014wr016874. As the 'cheap and cheerful' phrase and rhetoric has begun to spread, we've realized two important an unintended consequences of its use. It may be unintentionally offensive to some practitioners who already try their hardest to maximize the investment of every restoration dollar. It may confuse funders of restoration projects or create unrealistic expectations about total project costs. ​We now try to be more careful in our use of the phrase to avoid these misconceptions. However, to the extent that it focuses attention on both effectiveness and efficiency in restoration, we continue to promote the details behind the rhetoric. 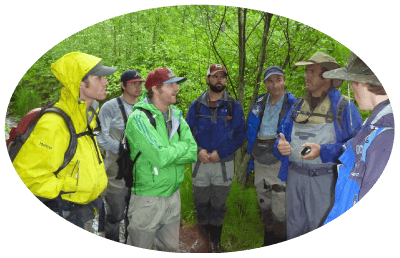 A healthy debate about what we mean by PALS are 'cheap and cheerful' in the rain in Asotin Creek.